Enjoying our latest posts? Share them with your followers with these easy steps! 1. 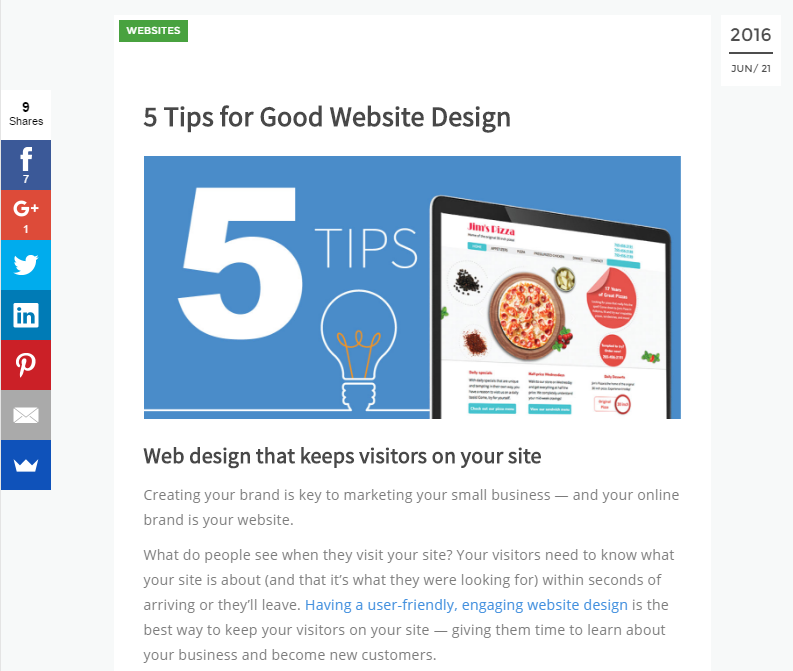 Find your favorite post on the official Hibu Blog – http://blog.hibu.com. 2. 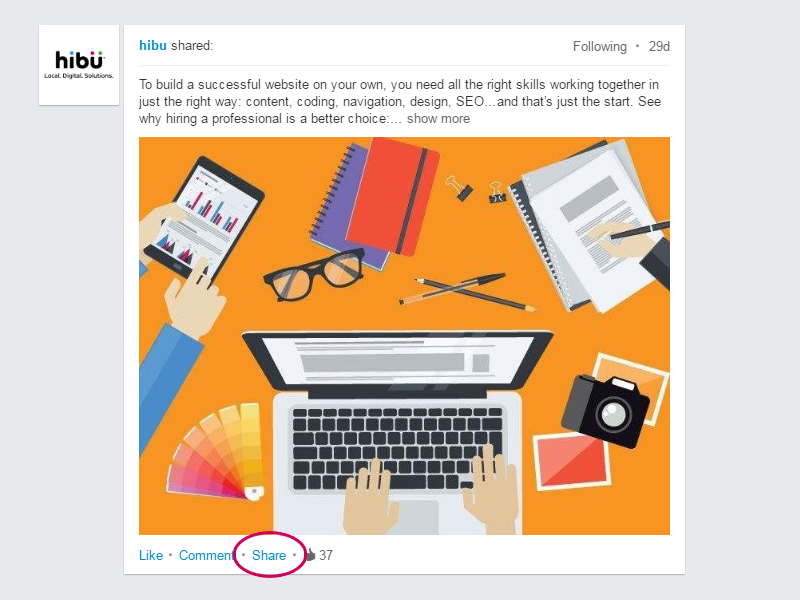 Locate the social media sharing widget on the left side of the page. 3. 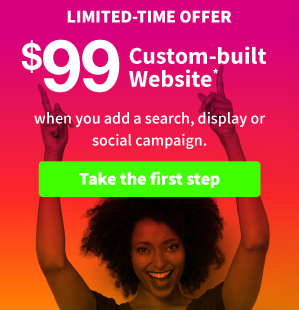 Click on the icon for your social media channel of choice. 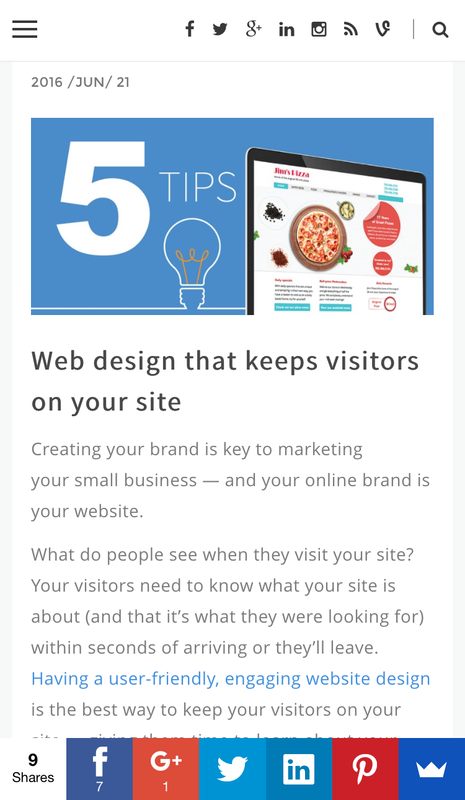 This will prompt a pop-up window requiring you to sign in if you aren’t already. 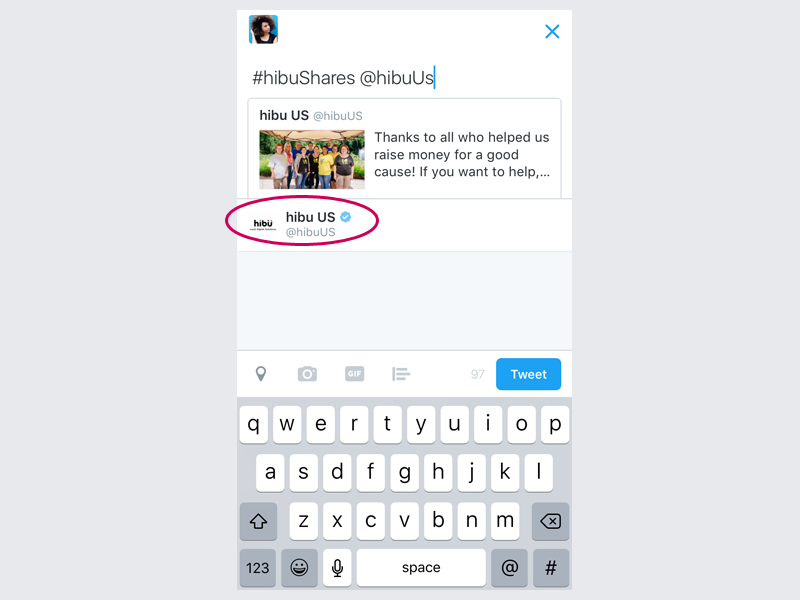 In the text box, include the “HibuShares” hashtag (#HibuShares) and “@” mention the Hibu US company page (@hibuUS). 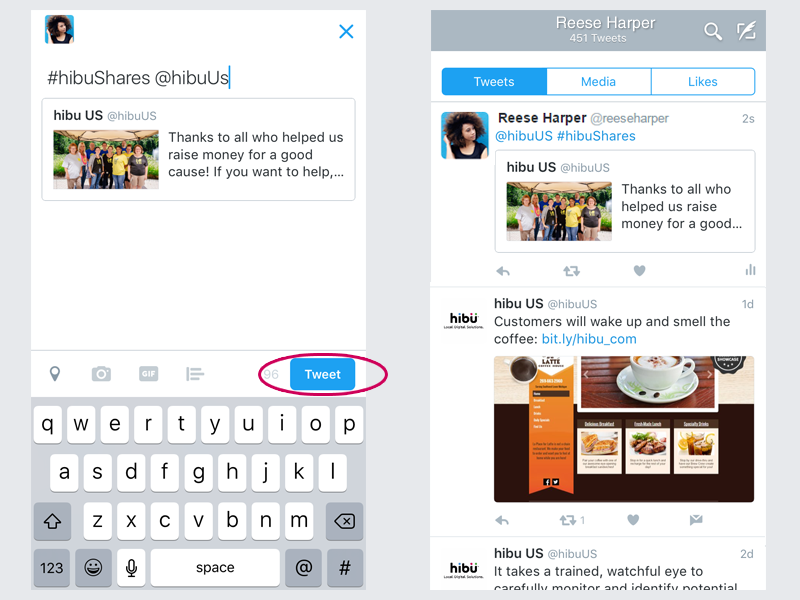 Typing “@hibuUS” will prompt a drop-down menu including multiple accounts. Choose Hibu to ensure it’s mentioned correctly. 4. 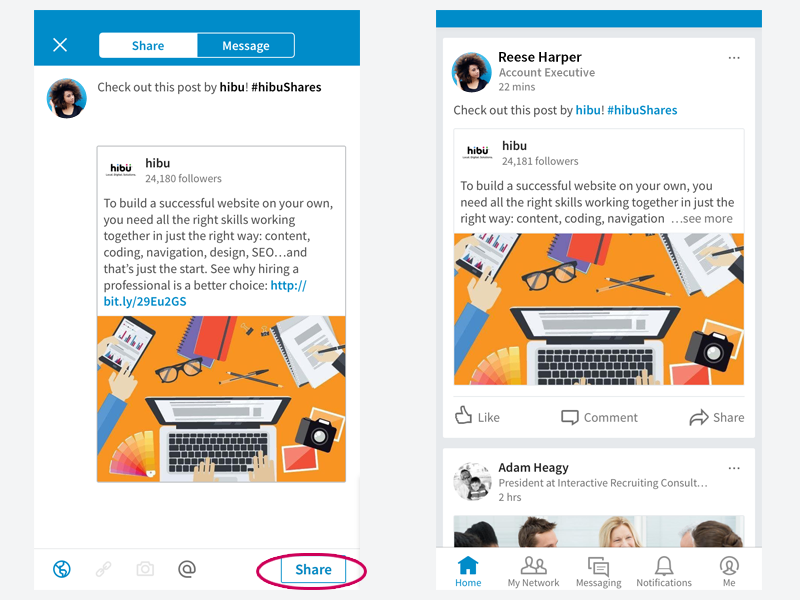 By clicking on ‘Post to Facebook’ (Google+: ‘Share’ | Twitter: ‘Tweet’ | LinkedIn: ‘Share’), this will send the post directly to your feed. The pop-up will close after you’ve shared the post. 2. 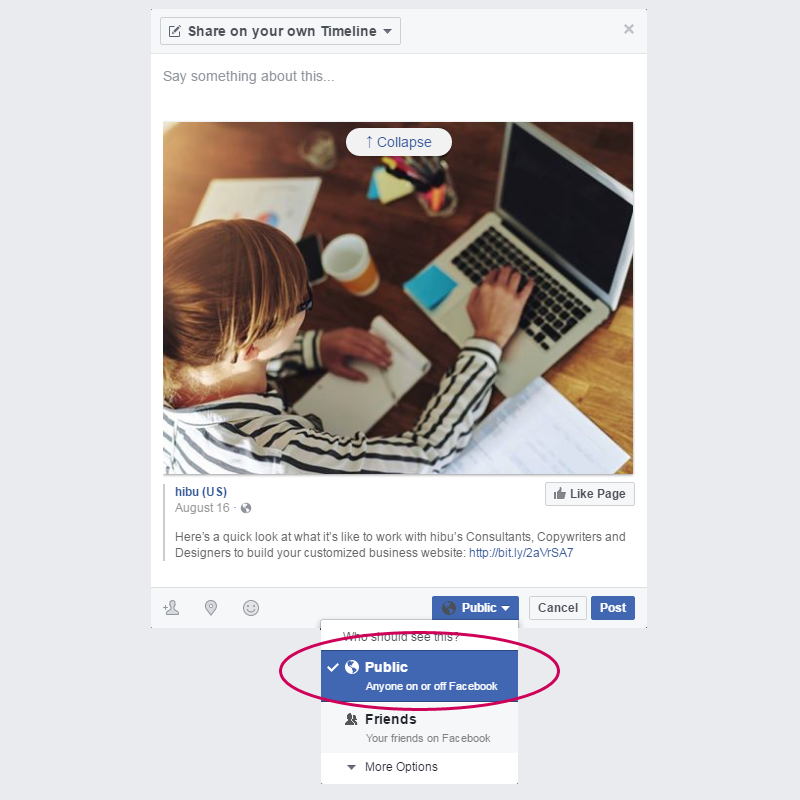 Locate the social media sharing widget at the bottom of your screen. 3. Tap on the icon for your social media channel of choice. This will prompt a pop-up window requiring you to sign in if you aren’t already. If you are already signed in using a social media app, tapping will open the respective app on your device. 1. 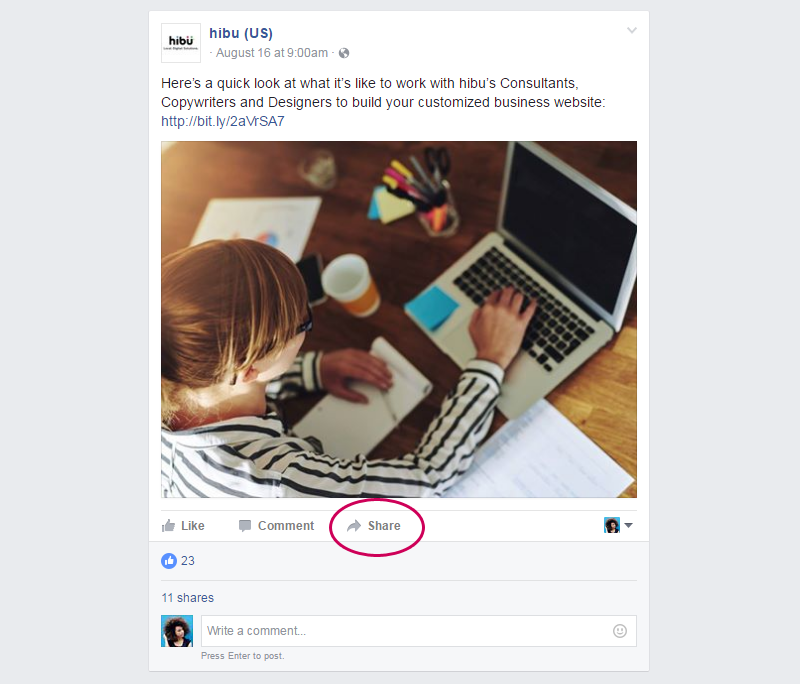 Find your favorite Hibu post on the official Hibu Facebook page – https://facebook.com/hibuUS. 2. 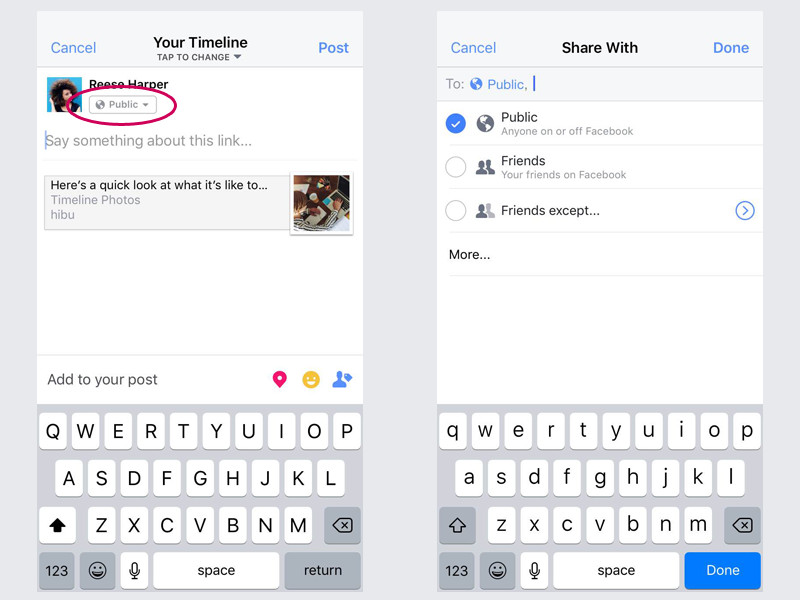 Click “Share” on the post itself and select “Share…” from the drop-down menu. 3. From the popup window, change your share setting to “Public” if it isn’t already at that setting. This only makes the post you are sharing public to people outside of your network, not your entire profile. 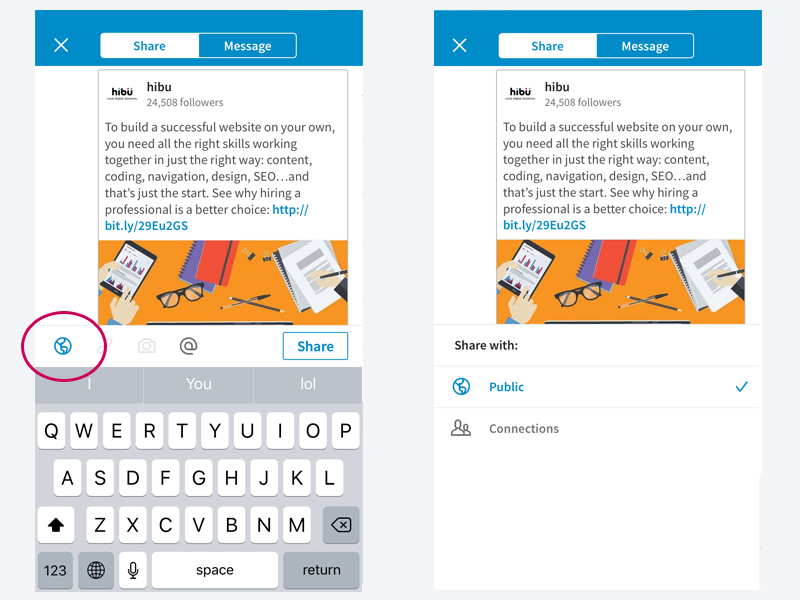 This is the most effective way to share the post. 4. 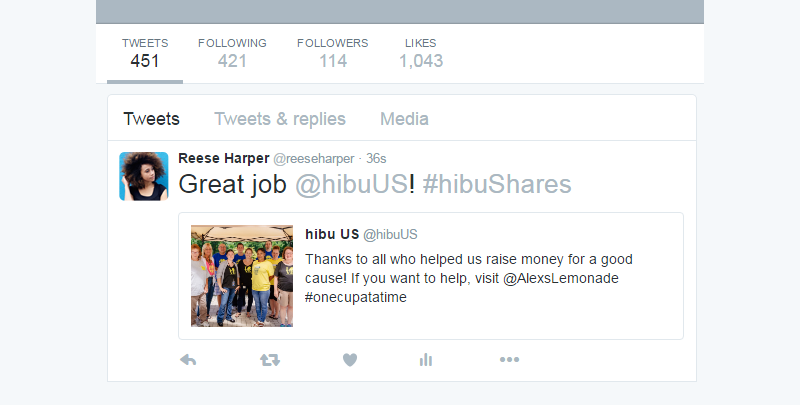 In the text box, include the “HibuShares” hashtag (#HibuShares) and “@” mention the Hibu company page (@hibuUS). Typing “@hibuUS” will prompt a drop-down menu including multiple Facebook accounts. 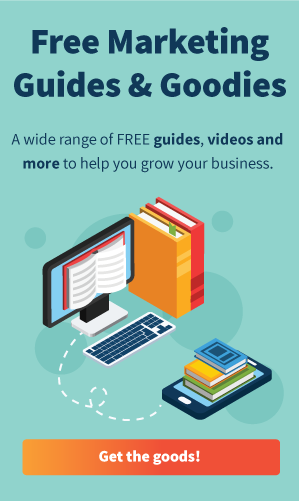 Choose Hibu to ensure it’s mentioned correctly. 4. 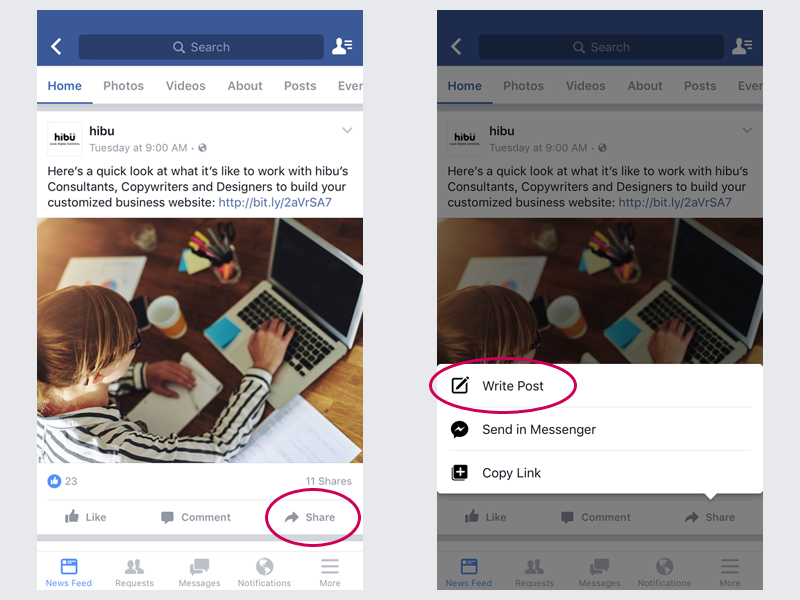 Click “Post.” Here’s how the post will display on your personal news feed. 2. Tap “Share” on the post itself. 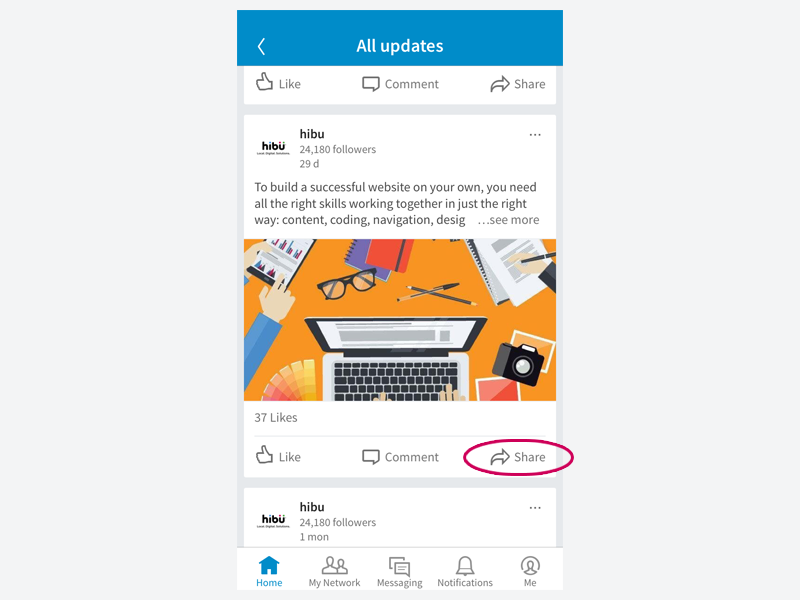 Tap ‘Write Post’ when the Share menu appears. 3. On the new screen, change your share setting to “Public” if it isn’t already at that setting. This only makes the post you are sharing public to people outside of your network, not your entire profile. 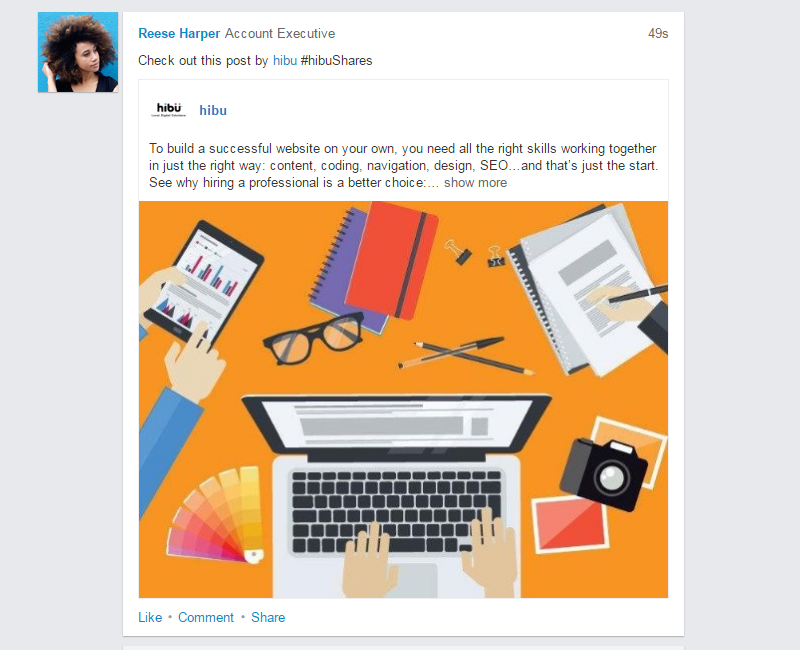 This is the most effective way to share the post. 4. In the text box, include the “HibuShares” hashtag (#HibuShares) and “@” mention the Hibu company page (@hibuUS). 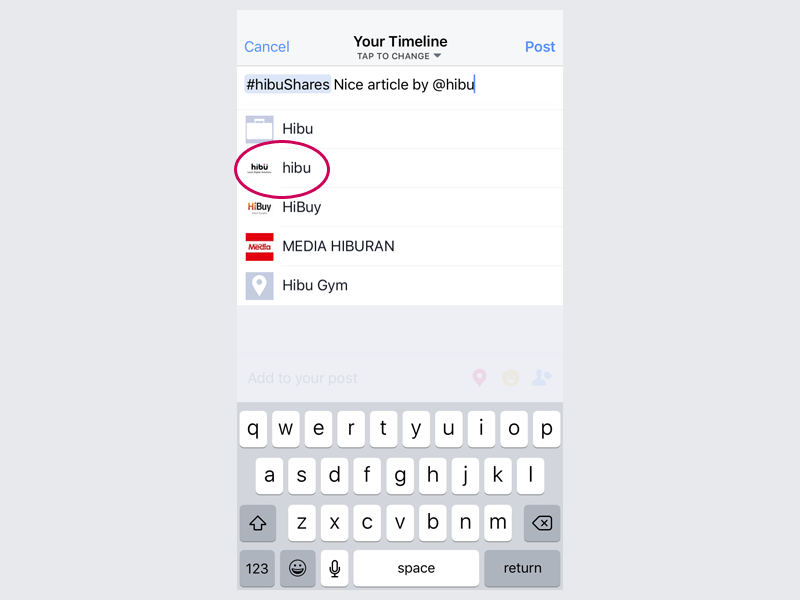 Typing “@hibuUS” will prompt a drop-down menu including multiple Facebook accounts. Choose hibu (US) to ensure it’s mentioned correctly. 4. 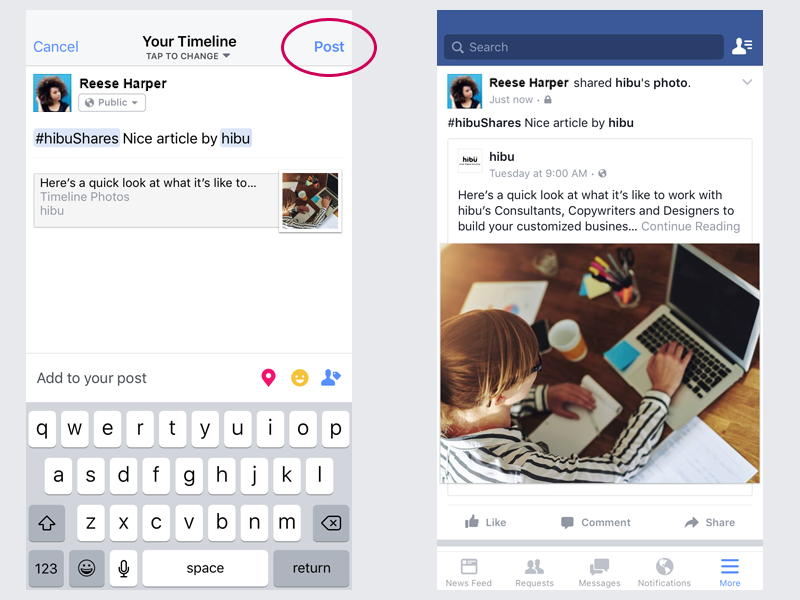 Tap “Post.” Here’s how the post will display on your personal news feed. In order to extend the reach of your retweets, you will need to unprotect your tweets if that setting is enabled for your profile. This will make your profile public. To disable protected tweets, locate your profile image in the upper right-hand corner (next to Tweet), and select “Settings” in the dropdown menu. 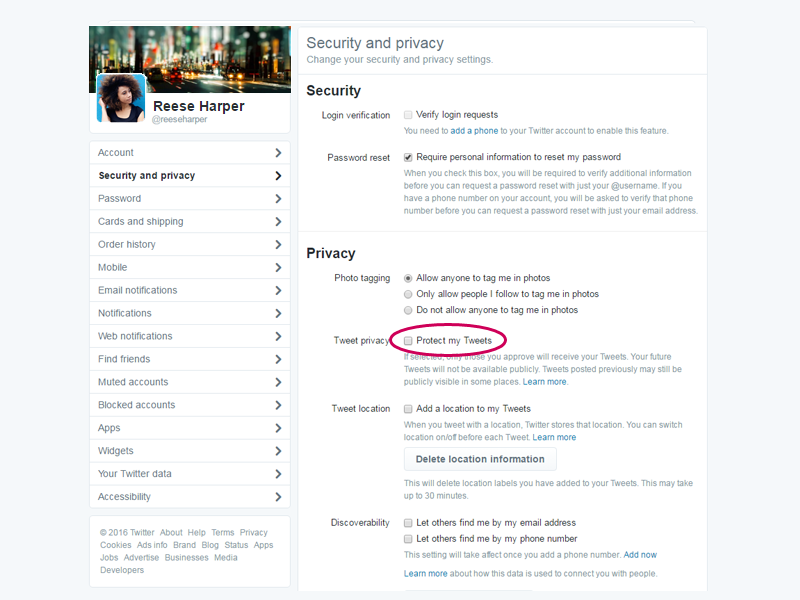 Select “Security and privacy” on the left hand side and locate ‘Tweet privacy.” Uncheck the box to make your tweets public. 1. 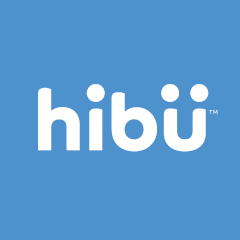 Find your favorite hibu tweet on the official Hibu Twitter page – https://twitter.com/hibuus. 2. Click “Retweet” (two arrows). 3. 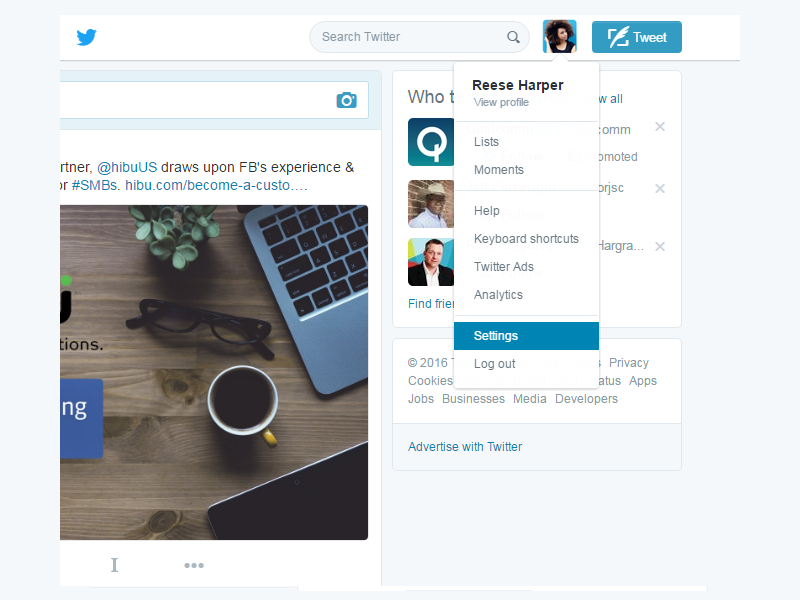 In the text box, include the “HibuShares” hashtag (#HibuShares) and “@” mention the Hibu company page (@hibuUS). Typing “@hibuUS” will prompt a drop down menu. Choose “Hibu” to ensure it’s mentioned correctly. 4. Click “Tweet”. 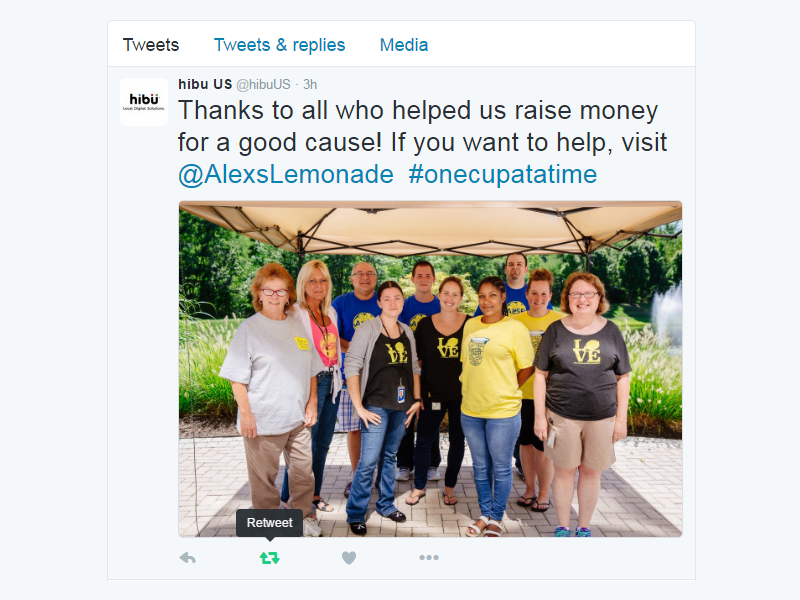 Here’s how the tweet will display on your timeline. In order to extend the reach of your retweets, you will need to unprotect your tweets if that setting is enabled for your profile. This will make your profile public. To disable protected tweets, select “Me” in the bottom menu. Once on your profile, tap the gear icon and select “Settings”. 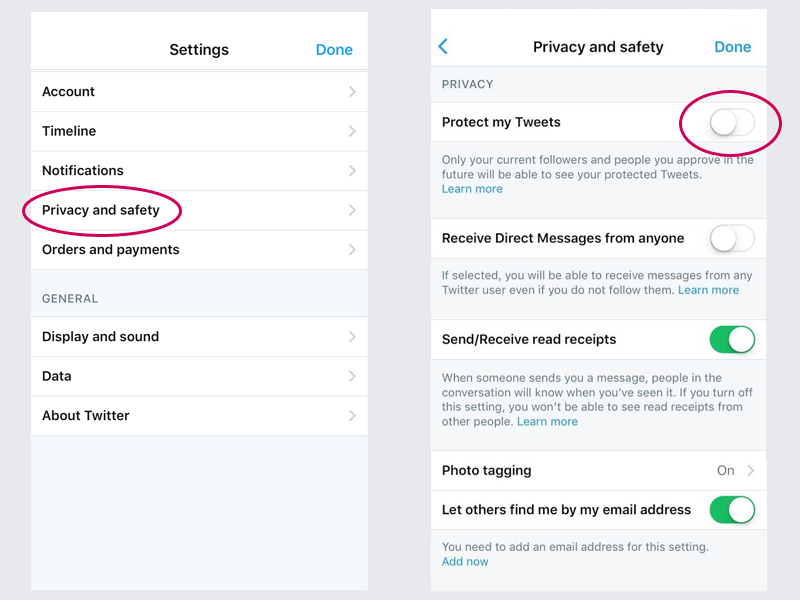 Select “Privacy and safety”, then tap the “Protect my Tweets” button off. 2. Tap “Retweet” (two arrows). Tap “Quote Tweet” to enable the keyboard to type. 4. Tap “Tweet”. 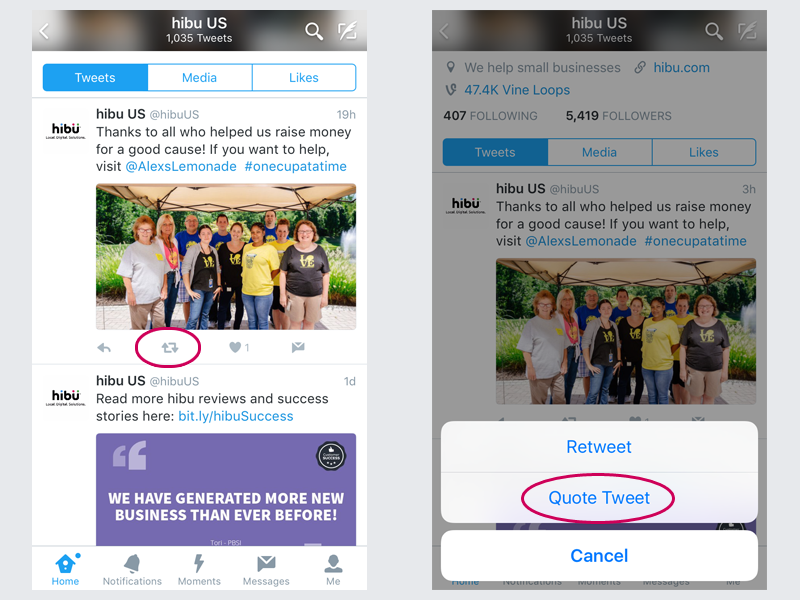 Here’s how the tweet will display on your timeline. 1. 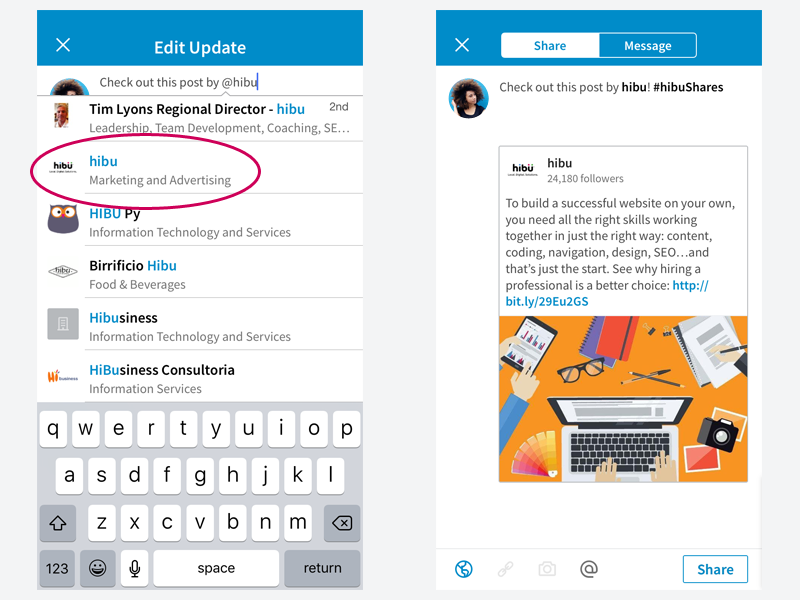 Find your favorite hibu post on hibu’s LinkedIn page – https://linkedin.com/company/hibu. 3. 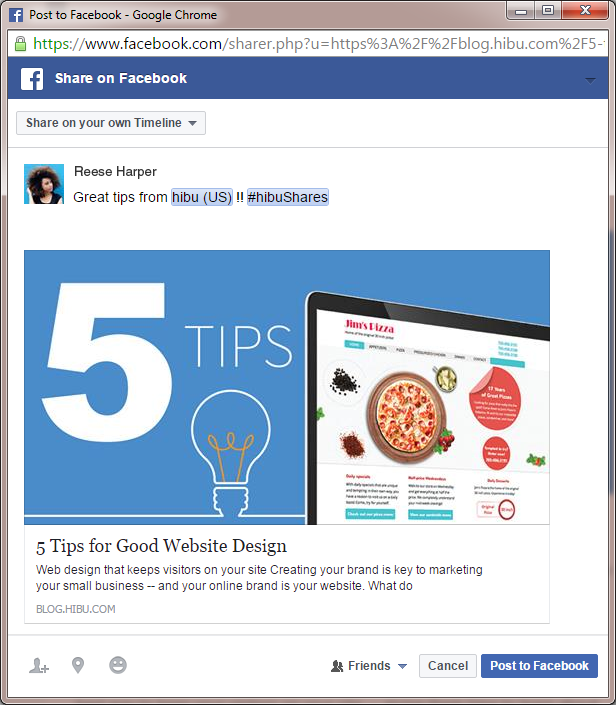 From the popup window, change your “Share with:” setting to “Public” if it isn’t already at that setting. 4. 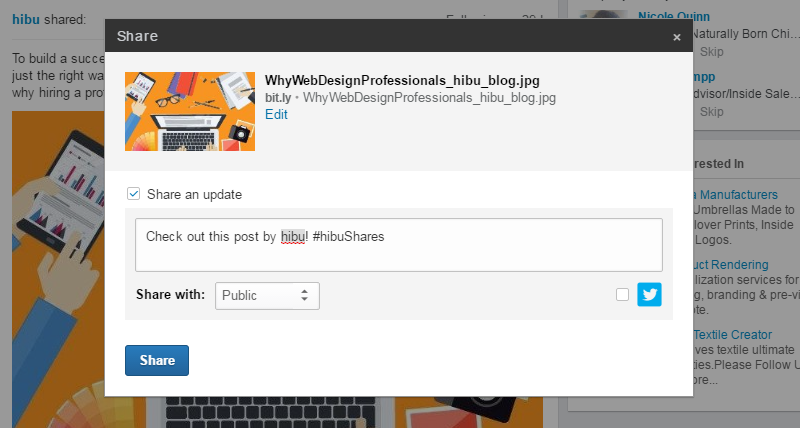 In the text box, include the “HibuShares” hashtag (#HibuShares) and “@” mention the hibu company page. Typing “@Hibu” will prompt a drop down menu. Choose “Hibu” to ensure it’s mentioned correctly. 5. 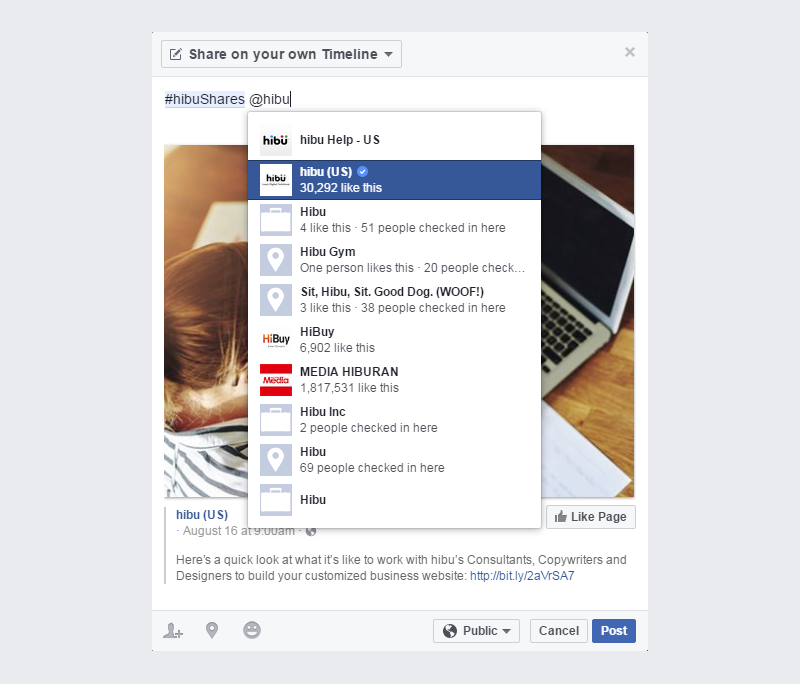 Click “Share”. Here’s the final result. 3. On the new screen, tap the globe icon to ensure your “Share with:” settings are set to “Public”. Tap “Public” to return to the text box. 5. Tap “Share”. Here’s the final result. Remember, click on the individual posts contained with the Social Digest or go directly to hibu’s social media pages or blog. 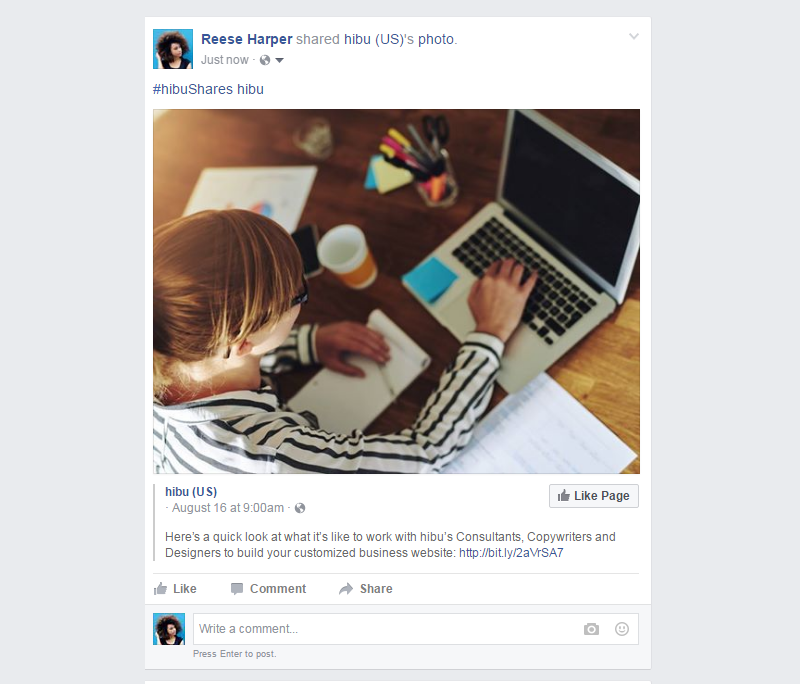 The key is to share posts directly from Hibu’s pages rather than sharing someone else’s post. Have a question? Don’t hesitate to reach us at USMarketing@hibu.com.